Daily PM2.5 samples were collected in Nanjing, a megacity in southeastern China, for a period of one-half of a month during every season from 2014~2015. Mass concentrations of nine water soluble inorganic ions (F−, Cl−, SO42−, NO3−, Na+, NH4+, K+, Mg2+ and Ca2+) were determined using ion chromatography to identify the chemical characteristics and potential sources of PM2.5. The mass concentrations of daily PM2.5 ranged from 31.0 to 242.9 μg m−3, with an annual average and standard deviation of 94.4 ± 31.1 μg m−3. The highest seasonal average of PM2.5 concentrations was observed during winter (108.5 ± 31.8 μg m−3), and the lowest average was observed during summer (85.0 ± 22.6 μg m−3). The annual average concentration of total water soluble inorganic ions was 39.82 μg m−3, accounting for 44.4% of the PM2.5. The seasonal variation in water soluble inorganic ions in PM2.5 reached its maximum during autumn and reached its minimum during spring. Sulfate, nitrate and ammonium were the dominant water soluble inorganic species, with their combined proportion of 82.0% of the total water soluble inorganic ions and 36.8% of the fine particles. 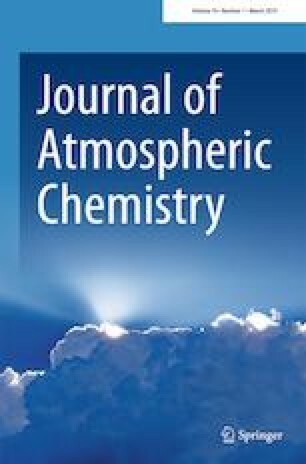 Seasonal variations in aerosol acidity and chemical forms of secondary inorganic ions were discussed. The average ratio of NO3−/SO42− was 0.95. According to the results of principal component analysis, secondary sources, burning processes, and airborne dust were the dominant potential sources of PM2.5 in Nanjing. This work was supported by the Major Special Program of the Ministry of Ecology and Environmental of China (GYZX180104), Basic Research Business Fees of Central-Level Public Welfare Research Institutes Project (GYZX170204), and the National Natural Science Foundation of China (No.201406116).